Fig. 1: Miniature current transformer with a diameter of approx. 11 mm. Current transformers are often used in applications where large currents must be measured or where a small measuring impedance is essential. A great benefit of the current transformer is the galvanic isolation between the measured current and the registration instrument. Usually the term "current transformer" is used to identify a passive current transformer as shown in figure 1, and is only suitable for alternating current applications. The frequency range is very depending on the construction of the transformer and the way it is applied. A current transformer has a minimal influence on the measurement and the circuit wherein it is inserted by its very low impedance and therefore the minimal primary voltage drop. Beside the passive transformers there are also active current transformers who are able to measure direct current. These are discussed in the article Oscilloscope probes. Just like a normal transformer a current transformer consists of a primary and secondary winding mounted on a closed core. The core can be made from iron or ferrite, or in special applications just air. The primary winding NP carries the current to measure. This winding is most of the times a single turn wire whose inserted through the core hole. The secondary winding NS has a large number of turns and is fixed mounted onto the core. This winding carries the transformed primary current and is connected to the measuring instrument. The transformation ratio is determined by the turn ratio NP/NS. If the primary winding only consists of a wire inserted though the core, than it counts as one single turn. The secondary winding of the current transformer should ideally be shorted. Because in contradiction to power transformers the current is transformed while the voltage must be kept low as possible. A shorted secondary winding guarantees a non-obstructed secondary current. A pure short circuit isn't feasible in practice, but a low as possible terminating resistance is the goal. This terminating resistance for current transformers is often called the burden resistor. Fig. 3: Current transformer terminated with a burden resistor. The reading is done with a voltmeter. Fig. 2: Current transformer terminated with an amperemeter. Figure 2 shows how the secondary winding is terminated with a low ohmic amperemeter. In a lot of cases the current will be measured indirectly with a voltmeter and a burden resistor (figure 3). This burden resistor must be kept low as possible. When manufacturing amperemeters they aim at a low as possible burden voltage. When a current transformer is used, the primary voltage drop can be kept low by increasing the turn ratio and a low terminating resistor. The previous chapter described an ideal current transformer. A practical transformer has a limited bandwidth whose dependent on the burden resistor and drive amplitude. To explain the behavior of a current transformer a simplified model is drawn in figure 4. Fig. 4: Simplified model of a current transformer. The transformer (N1, N2) is ideal. Lm represents the magnetization induction of the core including hysteresis. The magnetic fields of the two windings are never fully coupled, and the leakage fields caused by this are suggested by two series inductors LleakP en LleakS. And the ohmic copper resistances of each winding are RcuP en RcuS. The limitation of the bandwidth on the lower end is due to a combination of the voltage across the secondary burden resistor and the long period times. A higher burden resistor will cause a higher secondary voltage relative to a lower burden resistor at the same current value. A higher secondary voltage will result in a higher primary voltage and therefore a higher voltage across the magnetization self induction Lm. the phase shift between the primary and secondary current will become larger as visible in figure 10. Fig. 5: Distorted voltage and current shape due to overdriving a current transformer. The core is driven more and more in the direction of saturation which leads to distortion of the secondary current as well as the primary and secondary voltage. The result of this is shown in figure 9. The windings of a transformer are never 100% magnetic coupled. The magnetic field lines of one winding who doesn't reach the other winding are called the leakage field. The primary and secondary leakage fields are represented as the leakage inductance's LleakP and LleakS. These leakage inductances have influence on the behavior at higher frequencies. Because these connected in series with the ideal transformer will they cause an increase of the impedance at higher frequencies. The effective primary impedance is therefore increased. The properties of the current transformer described in this chapter do relate to a home made one as shown in figure 1. 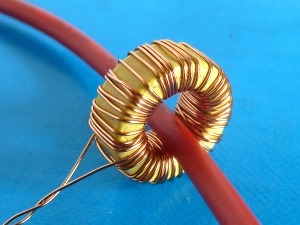 The secondary winding had 50 turns of Ø 0,22 mm wire on a Ferroxcube LT10/6/4-3E25 ring core. The ohmic resistance of this winding is 320 mΩ. The primary winding is a wire inserted into the core hole and has an ohmic resistance of 3,6 mΩ. The results shown in the graphs come from the measured RMS-values of the primary voltage and current secondary voltage at different frequencies. The phase difference is measured between the primary voltage and current and as well as the phase relation between the primary current and secondary voltage. Figure 6 shows the transformation error as function of the frequency with two different burden resistors. It makes it clear that a low burden resistor is advantageous to the bandwidth. If a measurement error of ±2 % is set as limit than is the bandwidth with a terminating resistor 8,3 Ω 800 Hz ... 20 MHz, and with a 50 Ω resistor it becomes a lot less: 4 kHz ... 4 MHz. The current depending error in the lower frequency range is displayed in figure 7. At higher currents the development towards a larger transformation error is sharper than at smaller currents. This is due to the increase of the core magnetization. A larger current causes a relative abruptly transition towards a saturated core and causes a lot of distortion. Fig. 6: Transformation fault of a current transformer. Fig. 7: Current depending transformation error. The primary impedance as function of the frequency is shown in figure 8. The center section of the impedance characteristic is flat. The primary impedance is equal to the transformed secondary burden resistance. The impedance decreases at lower frequencies because the magnetization current now plays a relatively large role. And because the transformer core becomes overdriven and the resulted distortion of the voltage and current makes it difficult to calculate the impedance and the error of it. Higher currents have an even bigger influence on this error as can be seen in figure 9. In the higher frequency range the couple factor between the primary and secondary windings will play a growing role. Fig. 8: Primary impedance of a current transformer. Fig. 9: Current depending primary impedance. Fig. 10: Phase error of a current transformer. The relative increasement of the magnetization current at lower frequencies will cause a frequency depended phase error between the primary and secondary current. This proporty must taken into account when a current transformer is used for phase and power measurments.